I have a small parcel west of Harrison back in the woods. 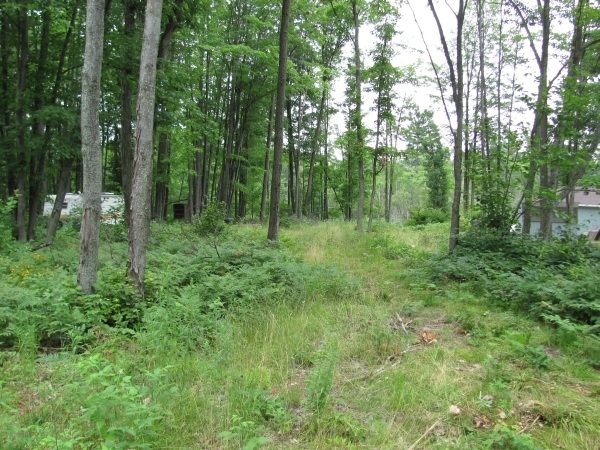 When my now ex-wife and I bought it 10 years ago or so, we put a 1/4 mile trail that winds along the edge of a small shallow pond and through the woods that cover much of the property. Not long after that our neighbor who we let walk the trails mentioned that she could see the outline of a dirt foundation next to the trail and about 100 feet from the pond. The foundation, for lack of a better term, was a a raised sand rectangle measuring about 16×20 feet. Trees up to 6-inches in diameter grew on and in the rectangle showing it had been there for a long time. However, it was a sign of human habitation (loggers, Indians, hunters) and got me excited so I dug through a couple of sections of the foundation looking for nails, wood or other signs of former walls. Sadly, nothing so I figured it must have just made to channel the rain outside of a large tent and probably made by hunters that might have frequented the site in the past when the pond was a lake and a nearby empty stream bed that runs through my property was once an active stream. Other than a few rusted tin cans I found nothing of value or interest. So I left it well enough alone until this fall. Some friends were coming up for the weekend so I took a rake and raked the interior of the foundation clean of leaves and debris, took a chain saw and cut out many of the trees and shrubs and dug out my metal detector.I was determined to figure out what the foundation was and whether there was anything of value in there. The answers: I don’t know and no. That weekend we set to work detecting and digging. Inside we found junk including two broken horseshoes (different styles) a conventional belt buckle, some hardware and broken pieces of tin. That means I still don’t know what it was or what it was used for. Why it showed signs of people AND horses is beyond me. The neatest thing was a railroad spike. It was not a large spike that one associates with the railroad. This one was about 6 inches long and an inch in diameter. 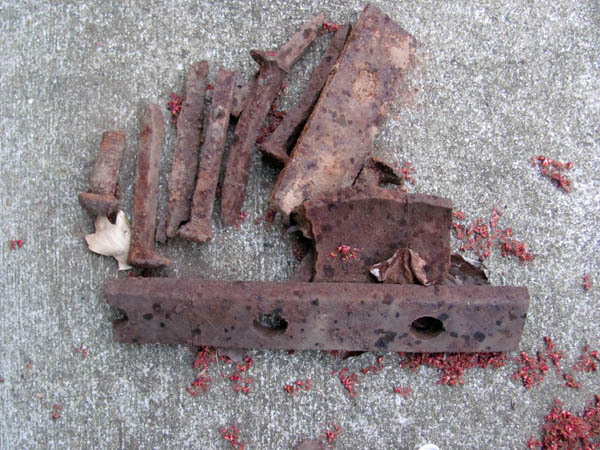 I had seen these spikes before and was told they were used to construct narrow gauge railroads. Once the railroad was no longer needed, the tracks were pulled up and the rails, couples, spikes and more were reused in order to save money. Apparently, the spike I found was left behind and might indicate that a logging railroad line DID in fact run across my property at one time. However, those finds were not the end of the story. Much of my pond evaporates by fall and the mucky ground is hard enough to stand on, so we took the metal detector out and set to work. It didn’t take long to find three items of interest: An axe head, a foot-long section of what appears to be a narrow-gauge railroad track and a piece of plow. Now I am more confused than ever. 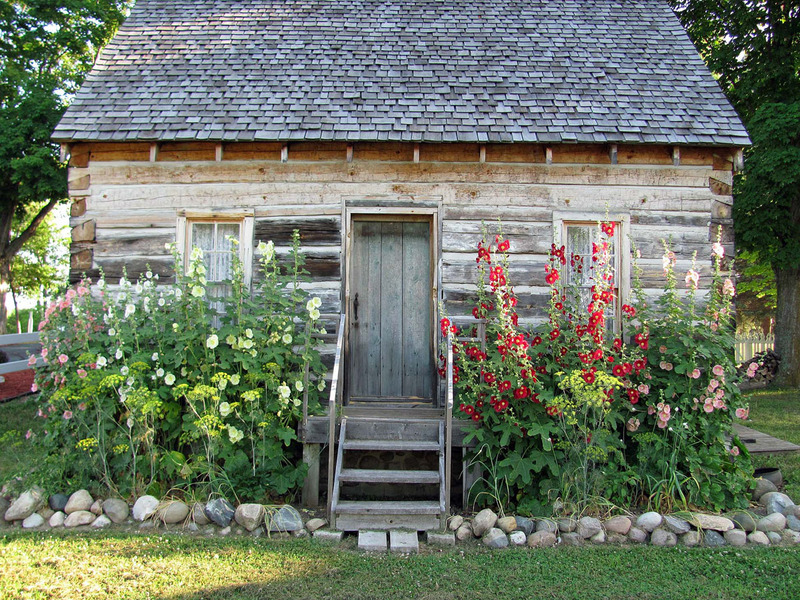 I know for a fact the property was lumbered–all the county was since it contained huge forests of white pine. The logging explains the axe head (although why someone would pitch a totally good axe into the lake/pond is beyond me. 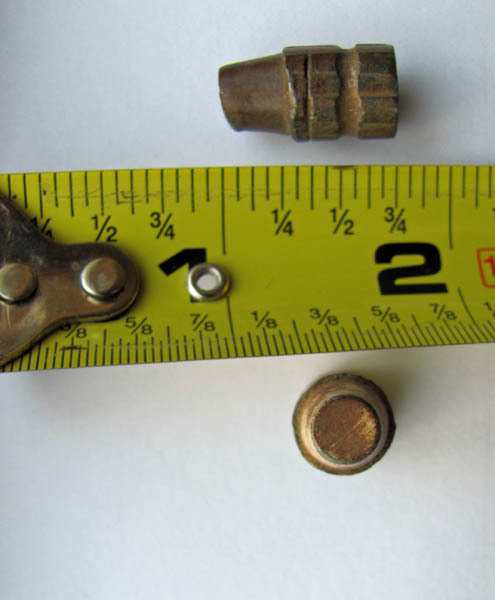 But what about the section of track and the spike found earlier? Was there a narrow-gauge railroad that ran along the creek on my property? I now have some evidence to support that fact. 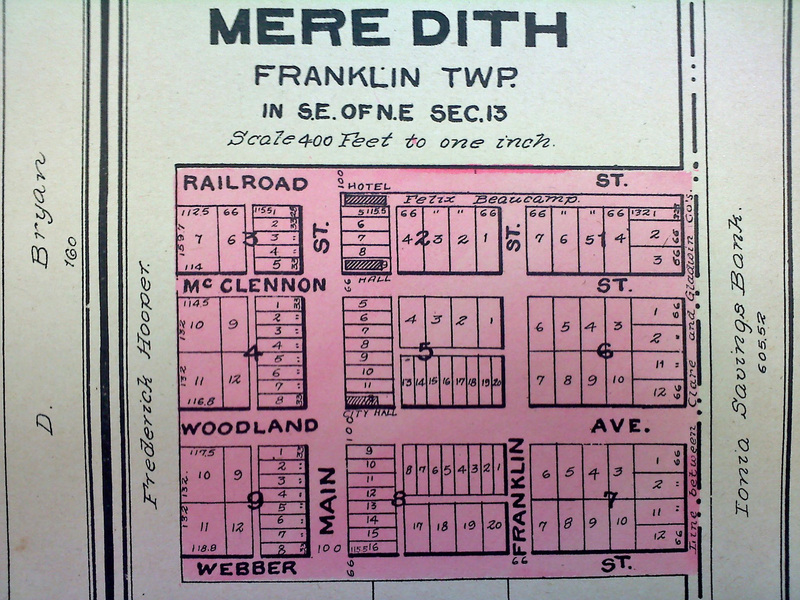 Other evidence includes a line indicating a railroad that appears on a map created by two members of the Clare County Historical Society. 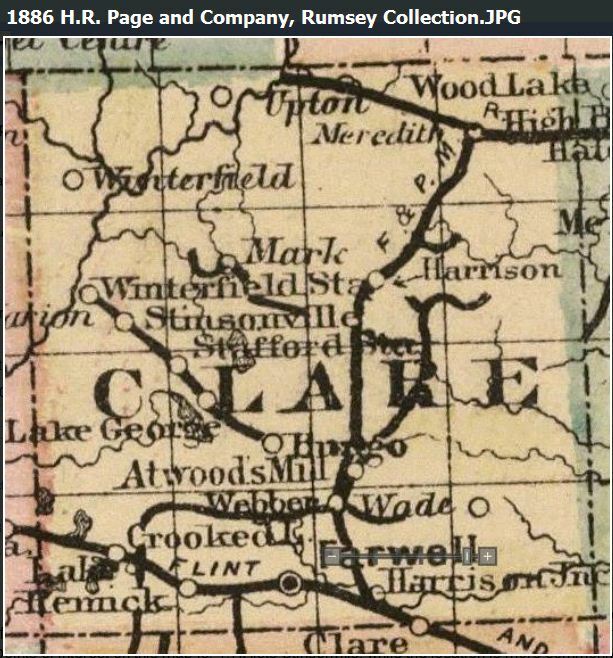 (Clare County had more logging railroads then any other county in Michigan, according to historian Roy Dodge who wrote the book, “Ghost Towns in Michigan.” But why the horseshoes and the foundation? And what about the plow? There is no evidence this area was ever farmed. But the rains came and filled the pond and winter has arrived freezing both the pond and the ground, that means any further explorations must wait until spring. 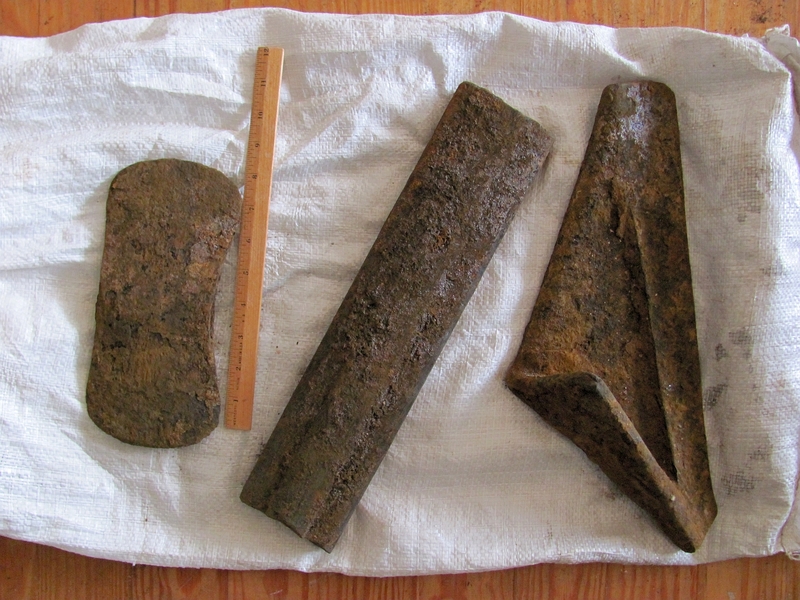 As for my three major finds from the pond, I donated them to the Clare County Historical Society. They may use them in their displays in their museum at the corner of Surry and Eberhart roads. The museum is closed now but reopens in the spring. And maybe by then I will have found even MORE stuff to donate. 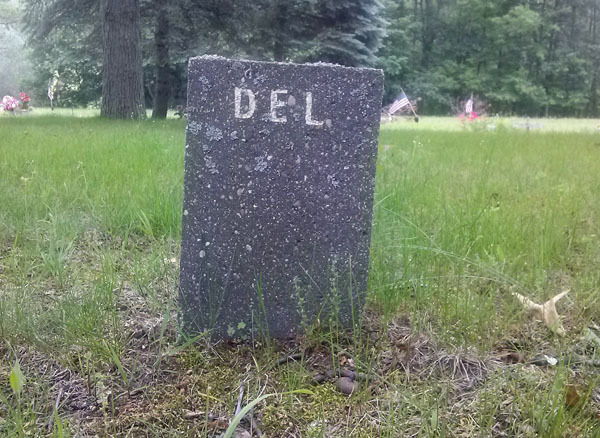 In Meredith, Michigan lies a cemetery, or more correctly, a former cemetery. Like the town itself, little remains to mark what once may have been the burying ground for those whose lives ended in this town in the northeast corner of Clare County. 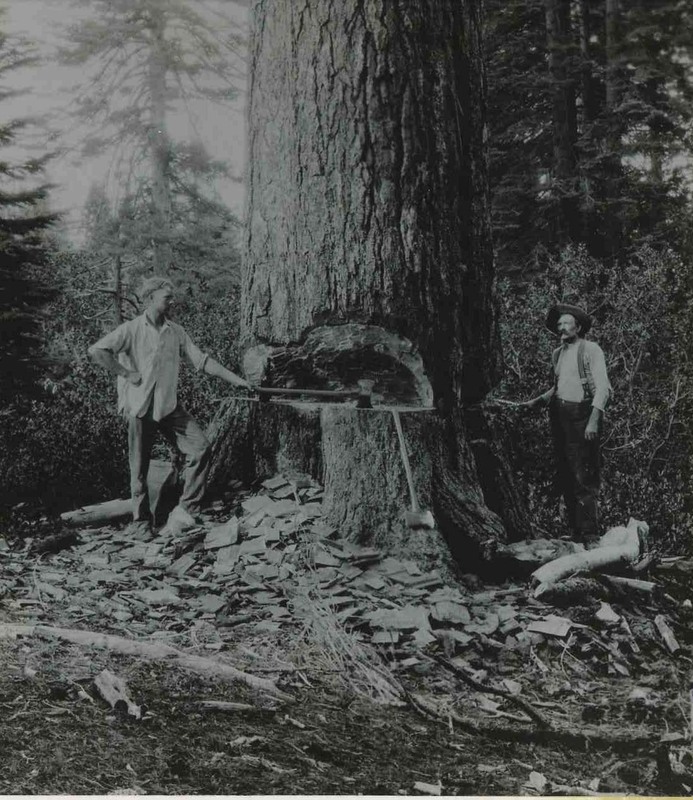 Meredith was once home to nearly 2,000 people and sported a three-story school, an opera house, a roundhouse for the numerous trains that rolled into town and saloons to help slake the thirst of the lumberjacks that came to the area in the mid- to late-1880s to cut the massive pines that once grew here. Now, Meredith is home to perhaps 300 hardy souls who enjoy the solitude this town offers. 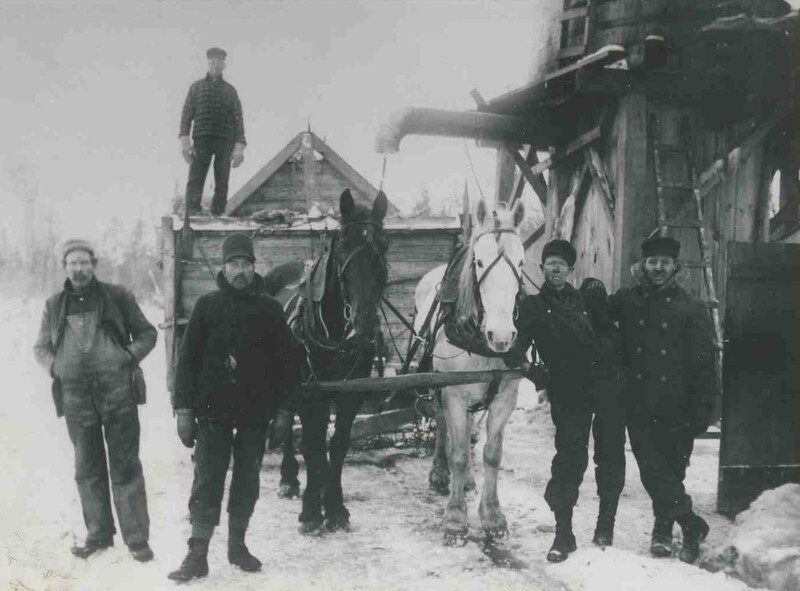 For nearly 20 years this town prospered, grew and was the home of not only lumberjacks but storekeepers, laborers, and railroad men and their families.It prospered. 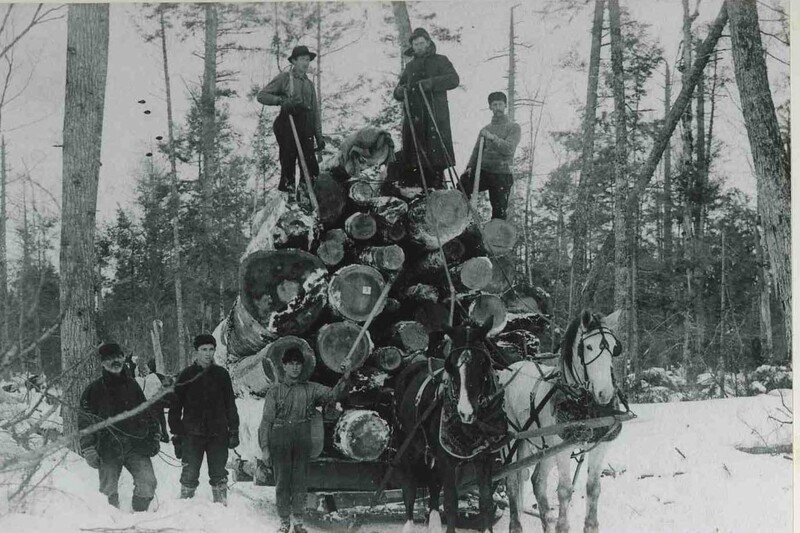 But once the lumber was cut, the jobs, like the trees that brought people to this north woods town, disappeared. And so did the people. They too left to find new jobs, taking with them memories and leaving behind the graves of loved ones like Edna Ross, who died in 1885 at the age of 10 and was buried in one of two local cemeteries. Now, Edna’s stone is one of two that can be seen in one of those cemeteries. The other visible tombstone lies some 40 paces away and belongs to a Ebbie Coffill, age unknown. Between the stones, trees grow and weeds flourish over ground where families and friends once mourned the passing of loved ones. Rumor has it that stones that once marked many of the other graves. Unmarked stones the size of pillows that the families picked out to mark the site where their loved ones would lies for all eternity or until the resurrection, while they, the living, would moved on in search of jobs and better lives. Did they know that someday, the cemetery would fall into private hands and that a the future landowner would sell those stones to a landscaper and placed as an attractive marker in someone’s yard? That someday, no one would ever know that a mother, father, son or daughter was buried under that spot. That nothing would be left to mark their passing or no one remember their lives. How many cemeteries are there like that in Clare county? Or in Michigan? No one knows. And they may always remain hidden unless a shovel or a piece of excavating equipment disturbs them as the living go about their lives. Although the fact the cemetery is gone may be sad for us the living, the fact the cemetery is gone may not matter to the dead. They are gone from this world and may not care. And if they don’t, should we? 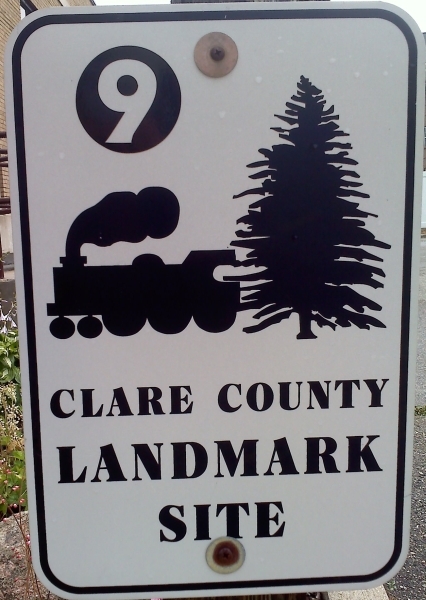 Twelve signs have been erected in Clare County, Michigan denoting historical places or celebrating events that took place within county boundaries.The sites are promoted a local Chamber of Commerce. 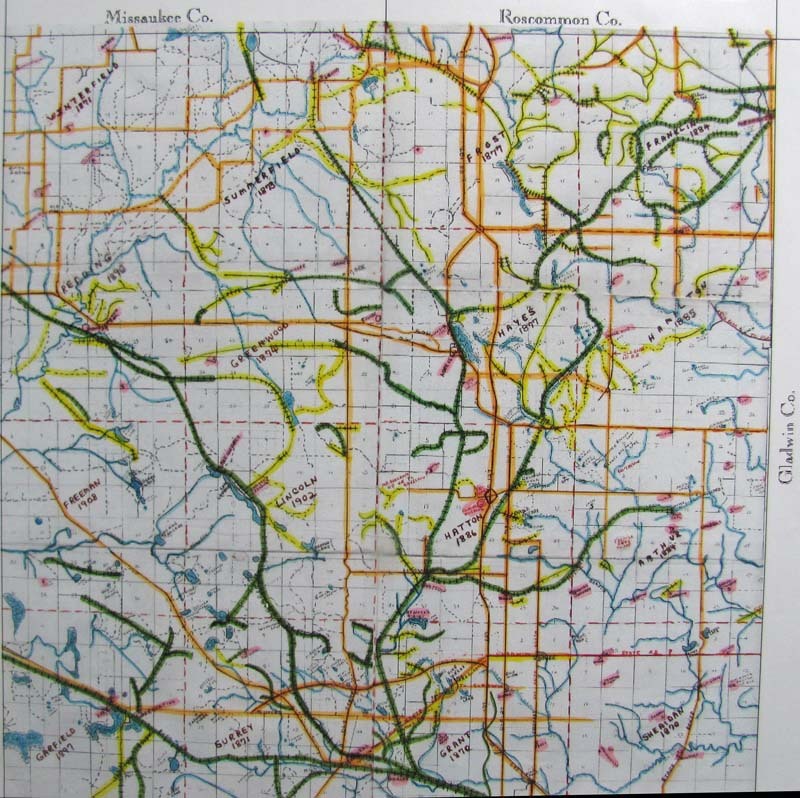 I was told that the sites were chosen by Clare County Parks & Recreation, the Clare County Historical Society and Central Michigan University’s history department. Most of the markers are related to lumbering that took place in the later part of the 19th century. 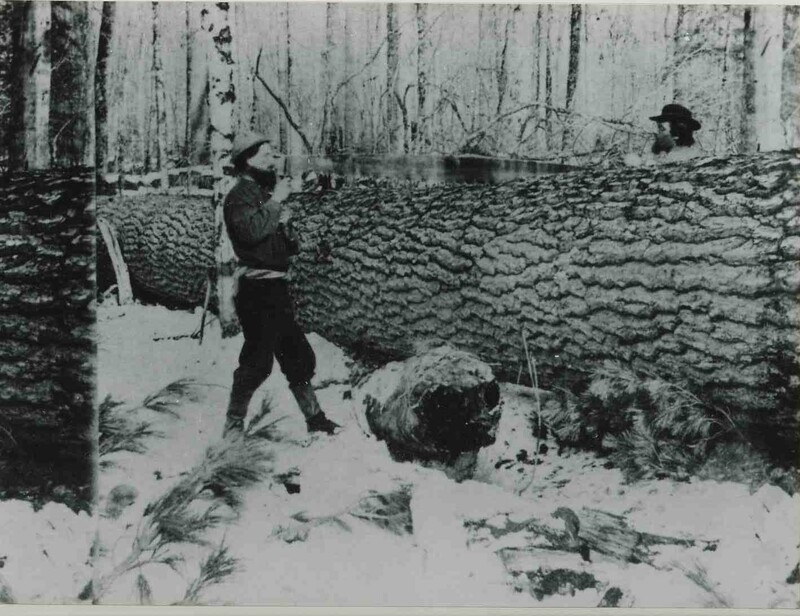 During that period lumberjacks came by the thousands to mid- and upper-Michigan to cut the towering virgin pines that grew to feed the growing hunger for boards and shingles in cities throughout the state and Midwest. These included cities like Chicago that was rebuilding after its massive fire in 1875. People became rich during that era. 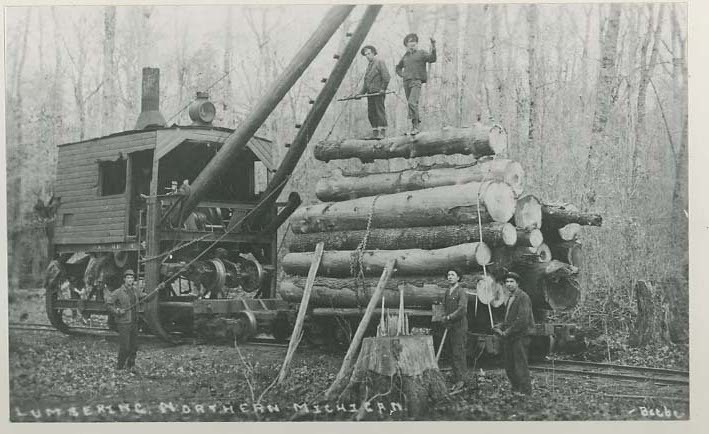 Not the lumberjacks who cut the trees and moved the logs, but those who owned the land, ran the railroads and the mills–and perhaps those owned the bars where the loggers drank away their earnings. I took a trip across the county in July to locate the historical sites to see if I could find the landmark signs and to see what I thought of them. In the end, I visited all 12 sites although I found only 10 markers. I am not sure if some of the sites on the tour should remain since nothing remains at the sites of an historical nature. 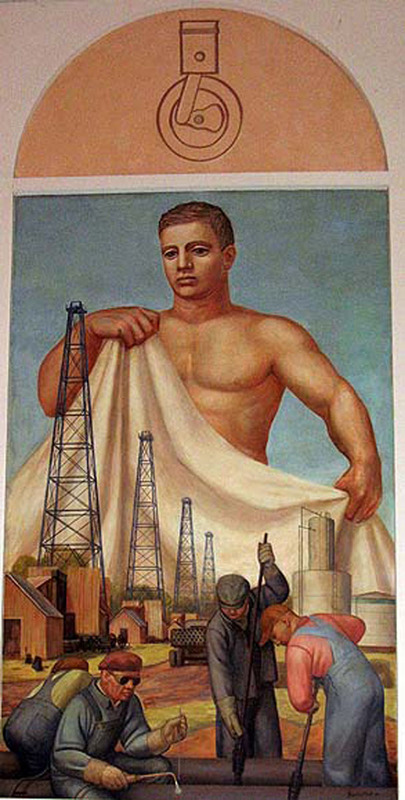 However, perhaps landmarks, like art, is in the eye of the beholder. Below is my take on the 12 sites along with directions, links and information that doesn’t appear in the Chamber tour that history buffs may find helpful. And although I may not agree with all the sites chosen, I still invite you to take the tour. It does make for pleasant afternoon drive. 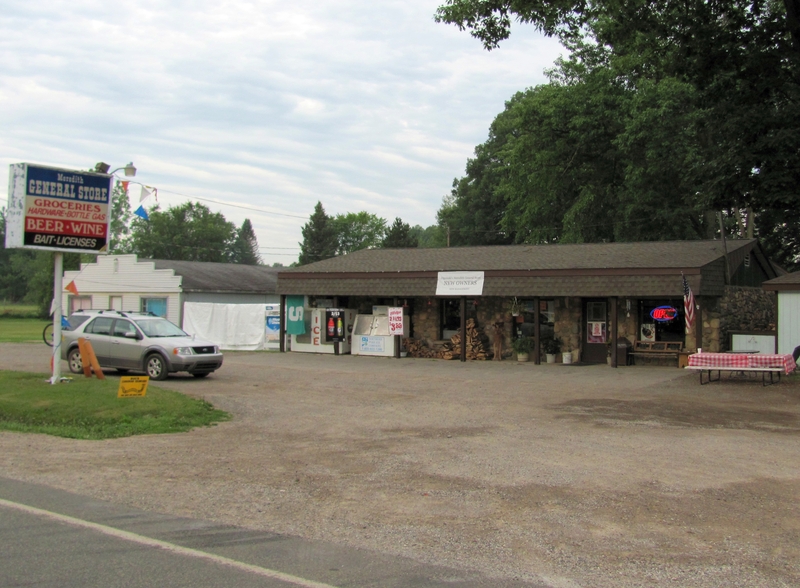 1) Leota: (Jonesville Rd., ½ mile north of Muskegon Rd.) Leota was a major logging town on the Muskegon River. Loggers brought their logs to the river where they were floated downstream to sawmills. I could not find the marker in the area, which is now an ORV trail parking lot. 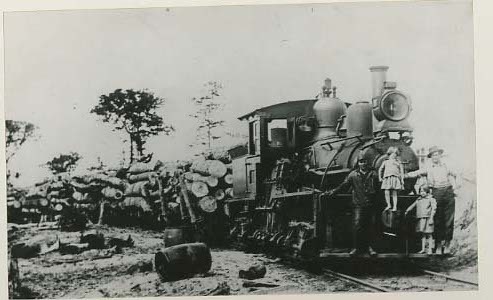 In the lumbering era, the site was reportedly used as a railway roll-off for timber being moved out of nearby forests into the river for transport to mills downstream. 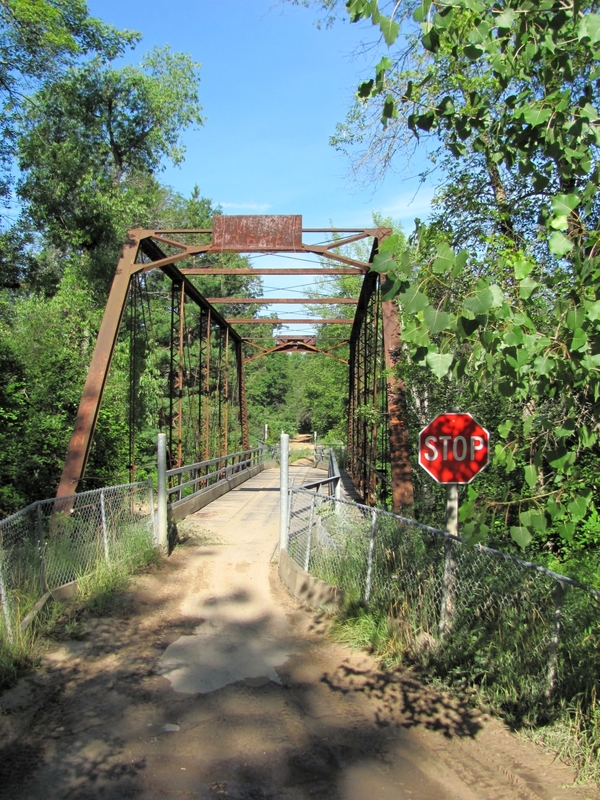 Although the Chamber tour states the bridge on the site was used by the railroad, it was part of the Old State Road built in the 1930’s. 2) Merideth: (M-18, 3-miles north of Arnold Lake Rd. in the northeast corner of the county.) This site of intersecting railways was once a bustling lumber town. 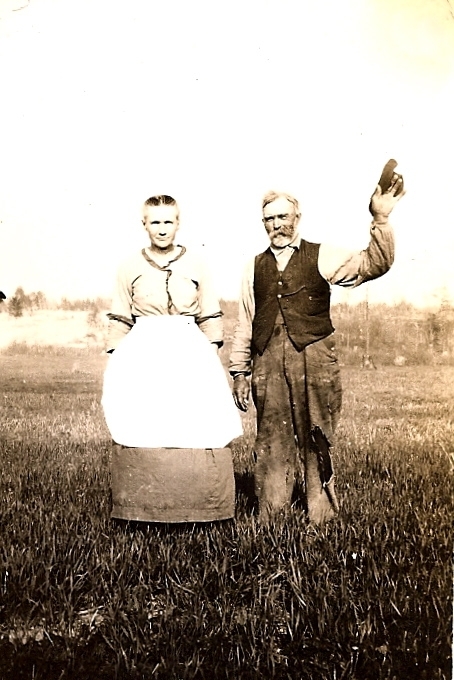 In 1885, 500 people lived in the town that sported several saloons, three hotels, an Opera House, jail, rail depot, roundhouse and three-story school. One of Merideth’s most infamous residents was saloonkeeper Jim Carr who is said to have trafficked in vices of all kinds including murder. It is said that when he died, seven ministers refused to officiate at his funeral and he was not allowed burial in the local cemetery. Not much of a historical nature remains in town. 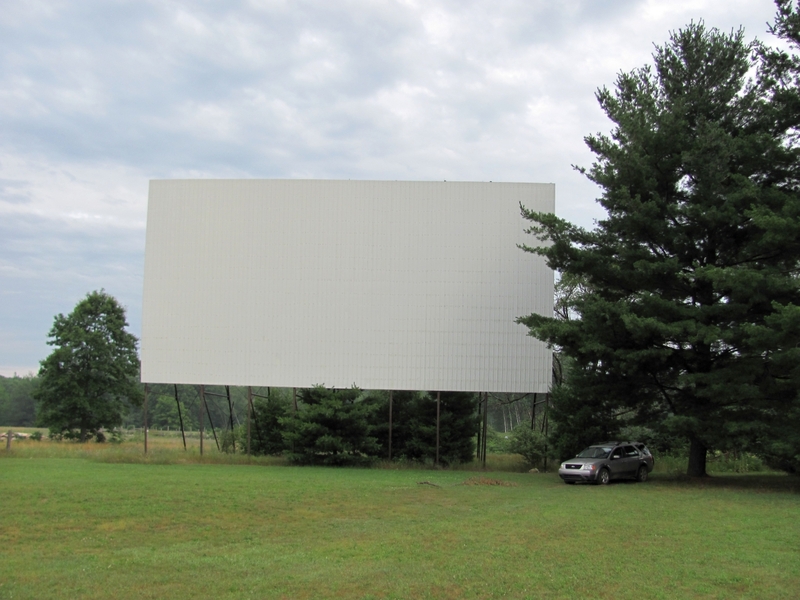 There is a screen from a drive-in theater that closed in the ’80s and a general store made of stone that may or may not be on the site of the former train depot. 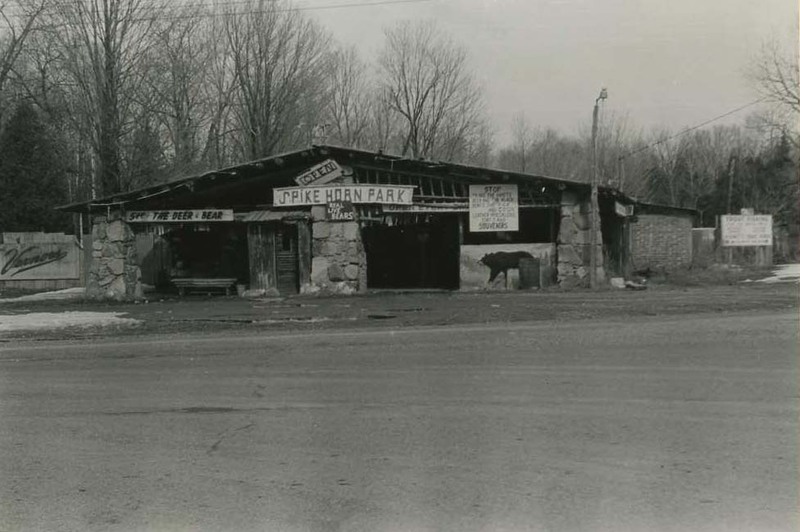 According to the book Michigan’s Ghost Towns, the theater stands where most of the former town once stood. 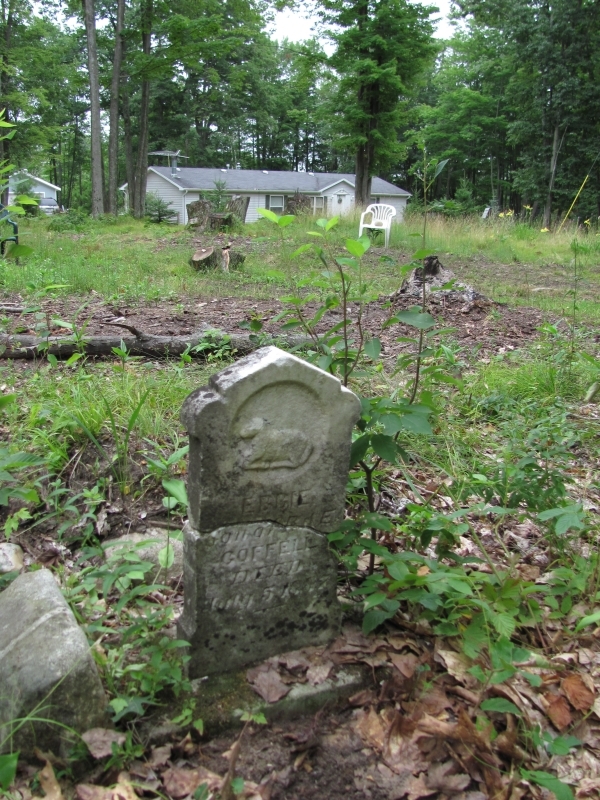 The old town cemetery is unmarked and on private property. 3) Surrey House: (125 E. Beech, Harrison) Originally called the Ohio Tavern when constructed around 1880, the Surrey originally had an attached livery. Rumor has it that the second story was used as a house of ill repute during its saloon days. It is also rumored to be haunted by the non-violent spirit of a boy. The building was remodeled into a hotel in the 1940’s and has been used most recently as a restaurant and bar. It is currently closed. 4) Spikehorn’s “Bear and Deer Park”: (Corner of M-61 and Business US-27, Harrison) John “Spikehorn” Meyers was one of Harrison’s most colorful characters. With his long white hair and full white beard, he was part showman, part naturalist, part politician and full-time foe of Michigan’s conservation officers with whom he fought legal battles because of his possession of wild animals. Spikehorn opened his park around 1930 as a tourist attraction and would hand-feed the bears and, along with his friend Red Eagle, would regale tourists with stories of their adventures in the woods. The park burned in the 1950’s. The photo depicts the site before the fire. Currently, part of the stone foundation is visible. 5) Campbell: (1901 E. Main, Temple) Now called Temple, this town, platted in 1899, was originally named after Mary Campbell who donated land for it along the Ann Arbor Railroad that ran past her property. Once home to 400, Campbell/Temple’s buildings included two hotels, a train depot, several saloons and grocery stores, sawmills and a two-story town hall. This was another Clare town that declined when the timber played out. 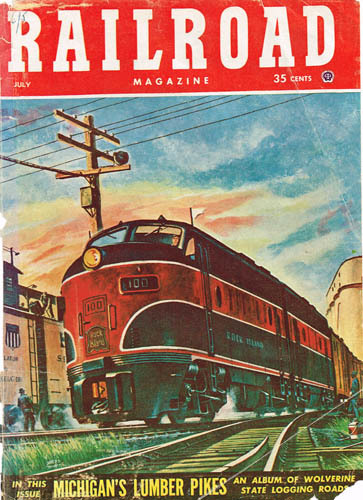 The final blow was when the railroad ended passenger traffic shortly after WWII. 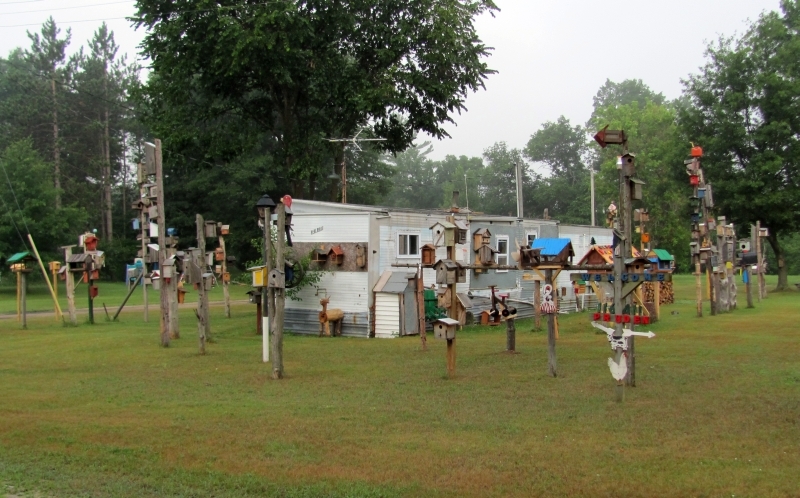 Now a quiet village, it is home to Duggan’s Canoe Livery and a man who must love birdhouses (photo). 6) Gerrish Railroad Plaque: (Roadside County Park on S. Clare Rd., south of Mannsiding Rd., between Clare and Harrison) Clare county probably has more miles of old railroad grades than any county in the state and that is in no small part due to Winfield Scott Gerrish, who introduced the first logging railroad in Clare County in January 1877. 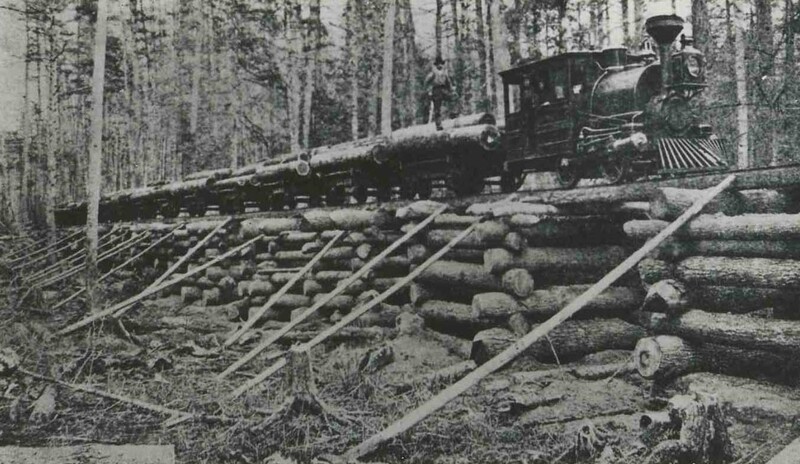 (Note: This post originally and incorrectly stated that Scott’s logging railroad was the first un the world. Gerrish got his idea after seeing a locomotive made for just such a use at a exposition in the eastern states. He bought two locomotives and had them brought to Michigan.) 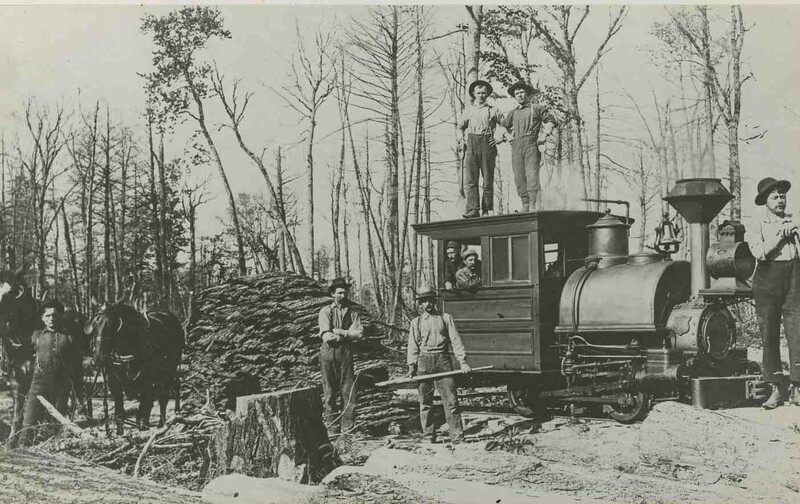 Called the Lake George & Muskegon Railroad, his train revolutionized the logging industry that, up to that time, relied on horses or water to move cut timber out of the woods. 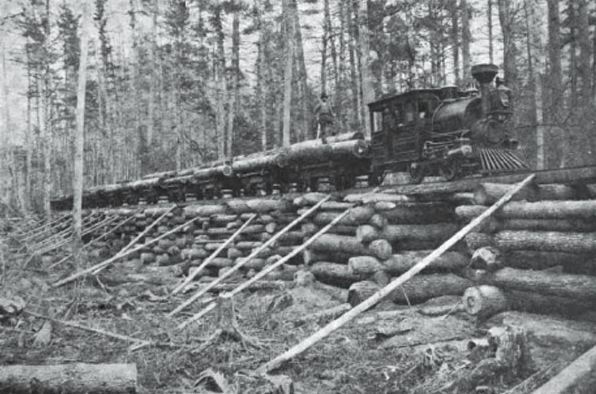 Even taking into consideration the time and expense needed to build the railbeds and lay down the track, the railroads proved extremely profitable as they cut expenses associated with moving timber out of the woods. A plaque commemorating Gerrish can also be found in the nearby community of Lake George. 7) Cornwell Ranch: (Cornwell Ave. ½ mile south of Mannsiding Rd. and east of S. Clare Rd.) A key employer in the early era of this county, this ranch had a major influence on the development of surrounding communities. 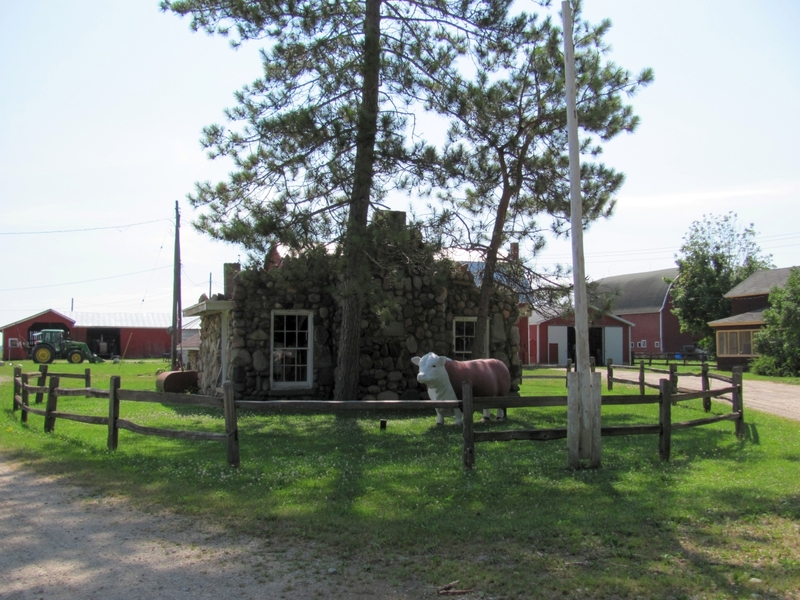 Many of the buildings on the ranch, as well as portions of the fence line are built of fieldstones and cobblestones found in abundance in the glacial moraine just to the south. 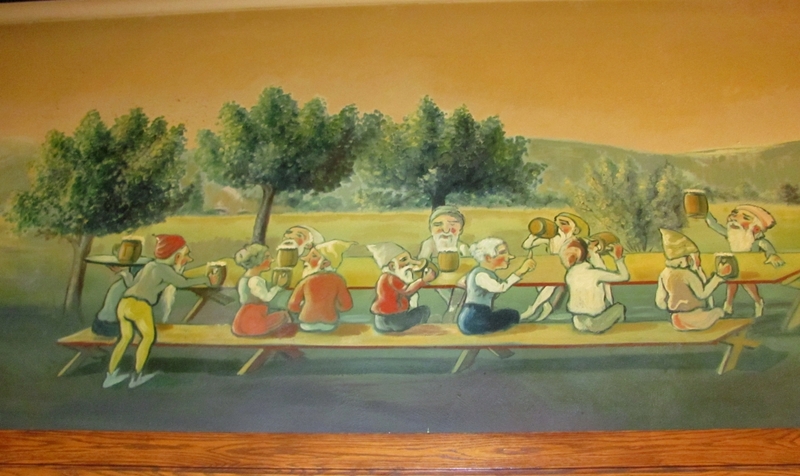 8) Depression Era Mural: (Doherty Hotel, McEwan St, Clare) Painted by Jay McHugh in 1932 this mural that is approximately 4-feet high and 75-feet long depicts leprechauns making beer. McHugh painted the mural in return for room and board. Articles in the lobby tell the story of the murals and the history of the hotel. a. Treasury Art (Clare Post Office, Fifth St., Clare) Entitled “The Mail Comes to Clare County,” this mural was produced under a Treasury Section of Fine Arts program similar to those down by the Works Project Administration. 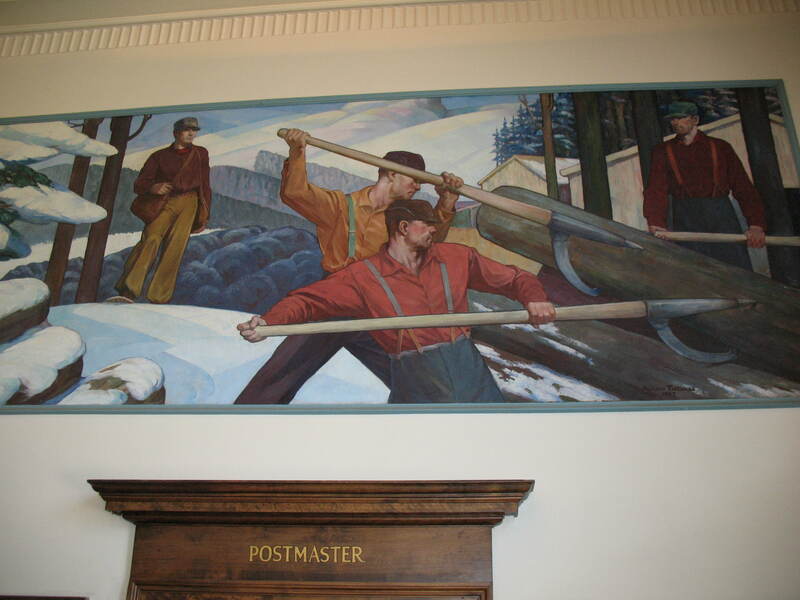 More than 50 post offices in Michigan have murals. The mural in Clare can be seen during regular postal business hours. b. WPA Art: (Clare Middle School, 209 E. State St. Clare) A mural, by Grand Rapids artist Gerald Mast fills one wall of the auditorium and celebrates farm life. It can be viewed by appointment. Call 989-386-9979 to arrange a tour. A second piece of art, an 8-foot tall sculpture entitled “Pioneer Mother” by Samuel Cashwan stands in front of the school. 10) Clare County Museum Complex: (Everhart and Dover Rds., five miles north of Clare and one miles east of S. Clare Rd.) 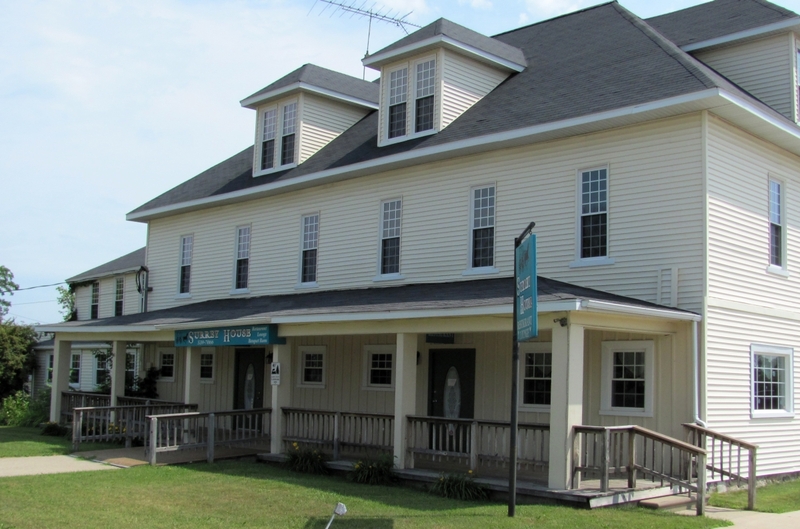 The former town of Dover is now the site of the Clare County Historical Museum complex that contains a museum with displays highlighting county history, the original Dover school built in 1876 and a log cabin used by Louie and Emma Ott to raise their 18 children. It was moved to museum grounds from within the county in 2000. The buildings are open Saturdays from 1-5 p.m. from May through September. 11) Farwell Historical Museum: (221 Main, Farwell) The museum highlights the history of Farwell, which once served as the county seat. 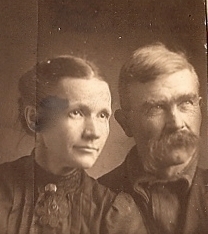 The town was established in 1870 along the line of the Pere Marquette Railroad and named for Samuel Farwell, a resident of Utica, New York and contractor for public works in the state. However, Farwell was also a major stockholder in the Flint Pere Marquette Railway Company that eventually came through town. It’s possible that Farwell was so named to curry favor with the railroad and ensure the town became a major stop. The museum is open Saturdays during the summer. 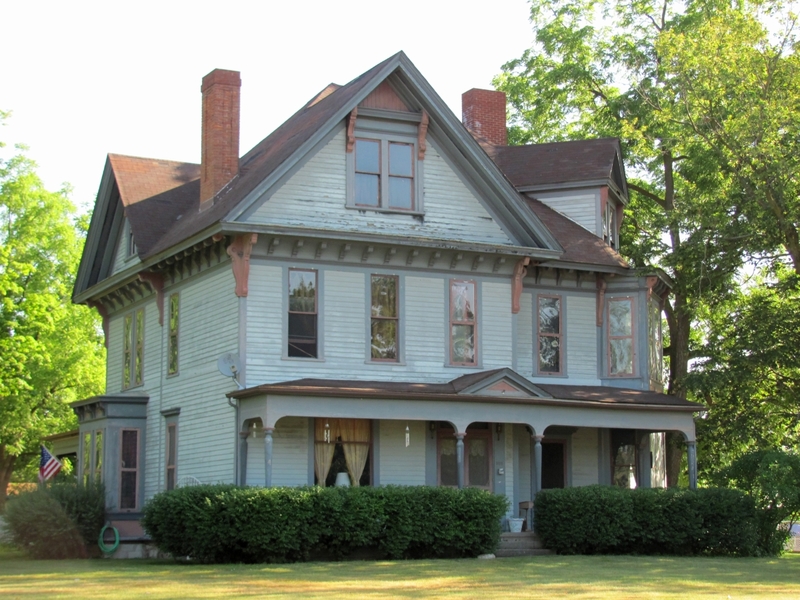 The town also has a wonderful Queen Anne style house built in 1895 by George and Martha Hitchcock that stands at the corner of Michigan and Superior. 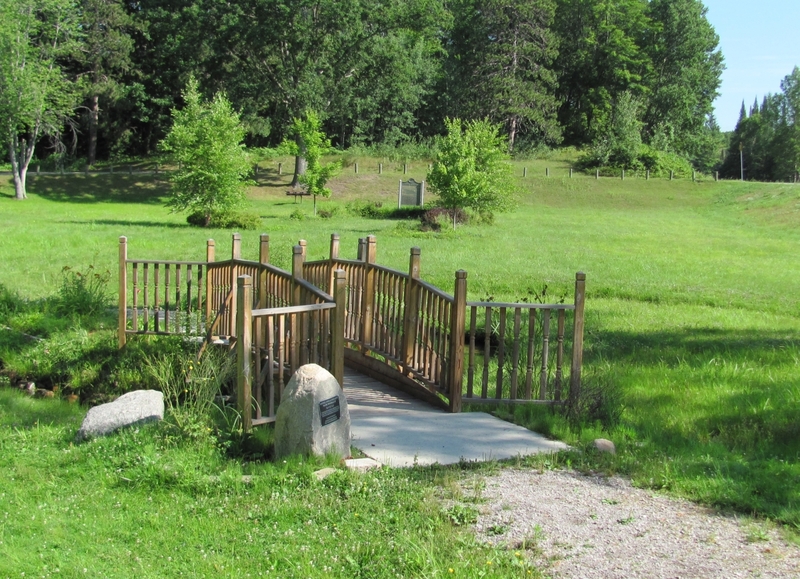 12) Wilson State Park: (Shore of Budd Lake, Harrison) William Wilson of Wilson Brothers Lumber Company that had owned much of the land around Harrison and ran a sawmill on the banks of Budd Lake, deeded 40 acres to the City of Harrison to be used as a park. The park was given to the state in 1922 and became a state park in 1927. 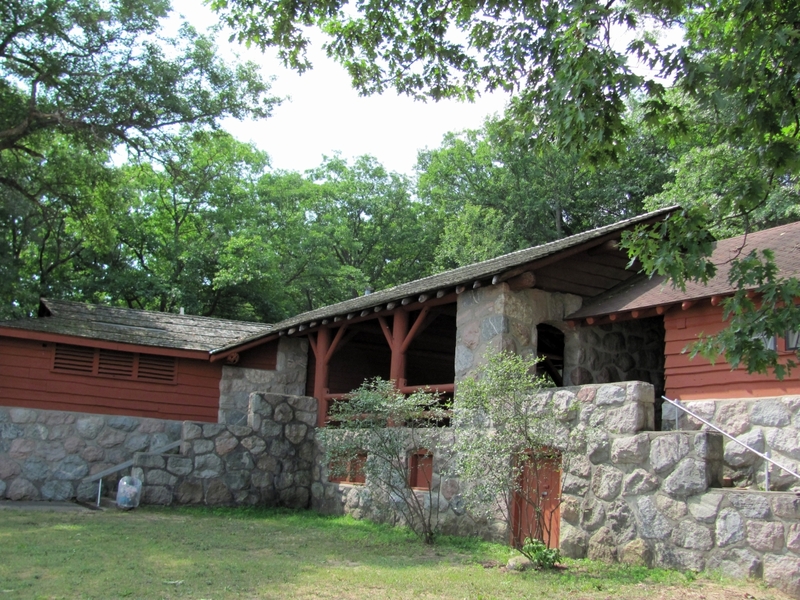 In 1939, the Civilian Conservation Corp constructed the main park building, which is still used today. They also built a stone residence with rock from nearby counties. The park is located right in Harrison and has modern campsites, a beach and is adjacent to the county fairgrounds. More info. Note: All photos, except for the Spikehorn photo were taken by the author. The Spikehorn photo is from the collection of Forrest Meek and can be found in the Mid Michigan Community College library. Please contact the author if you find any of the information in this tour to be in error or know of any other historical sites in the county you believe deserve recognition.